Medical robotic devices today are used to perform complex surgery, replace missing limbs, assist in rehabilitation, and deliver nutrients to precise locations inside the human body. Exciting innovations in robotics are allowing people to overcome health problems in ways that were never before thought possible. Surgeries on the battlefield can be performed with a remote control from half way around the world, patients are responding to robotic therapists, and paraplegics are walking with the assistance of a robotic backpack. Research and Development (R&D) is spearheading the efforts. Federal and State research and development tax credits are available to shoulder the costs. To remove a gallbladder or get to another organ, surgeons typically used conventional hand tools. Today, many sit at a computer console, guiding tiny robotic arms which are downscaled to enter the patient's body through small incisions in a way that traditional methods could not accomplish. Minimally invasive surgery robots such as the Da Vinci Surgical Systems, made by Intuitive Surgical Inc. of Sunnyvale, California, translate a surgeon's hand movements on the operating console to reduced scale micro-movements of tiny instruments inside the patient's body while the surgeon tracks his/her movements on an amplified video screen of the surgery area. The effect of the machine is to give the surgeon more control and visibility in a minimally invasive environment. An NYU surgeon noted, "It's as if I've miniaturized my body and gone inside the patient." Proponents say the surgery involves less scaring, less pain, less blood loss, fewer complications and shorter hospital stays than conventional surgery, which often involves larger incisions. Intuitive is consistently updating their machine as well. The latest version, The Da Vinci Xi system is the fourth version of the surgical robot since the year 2000. The recently FDA approved machine costs about the same as older models, but includes overhead surgical arms which make it possible to reach all parts of a person's anatomy without repositioning the machine during surgery. Still, the machine is costly starting at $1.85 million But, Intuitive says that even if the robot costs more money it brings in extra revenue because many patients will only go to a hospital that uses the robot. Intuitive is constantly innovating its product as well. In 2013, it had R&D expenses of $167,700,000. Surgical robots such as the Da Vinci made by US company; Intuitive Surgical and the ZEUS, made by US Computer motion are already widely in use. Since 2000, 1,370 U.S. hospitals have purchased at least one of the Da Vinci robots. Mako division of Stryker Corp.
Stryker, one of the world's leading medical technology companies attributes their success to innovation and customer relationships. When their founder, Dr. Homer Stryker, found that certain medical products weren't working he invented new ones and started the company in 1941 to produce them. More recently, the company agreed to buy Mako Surgical Corp. in Fort Lauderdale, Florida for $1.65 billion in an effort to further advance the growth of robotic assisted surgery. Mako pioneered the use of robotic-assisted surgery in orthopedics since being founded in 2004. With Stryker as a large financially strong corporate parent, Mako now has access to better finance terms (which is particularly important with capital equipment) and a wider range of hospital and physician contacts. Striker CEO and president Kevin A. Lobo says, "MAKO has established a compelling technology platform in robotic assisted surgery which we believe has considerable long term potential in joint reconstruction," Mako CEO and president Maurice R. Ferré, M.D. had this to say: "The combination of Stryker's established industry leadership with MAKO's innovative products and people contains the power to positively transform orthopedics... It is with this in mind that MAKO's board of directors unanimously voted to recommend that MAKO's shareholders vote in favor of it." The military wants to use robotic operating machines similar to the Da Vinci to perform surgery on wounded Veterans from a safe distance. Blake Hannaford and colleagues at the University of Washington, in Seattle have come up with a system small enough to fit in the back of an armored vehicle. Implementing this machine could solve a large problem, namely the lack of skilled surgeons on the battlefield available to perform complex surgeries. In 2013, iRobot introduced the RP-VITA, (Remote Presence Virtual + Independent Telemedicine Assistant) -- the medical version of the Ava which is commonly used in business settings (Discussed more thoroughly in R & D Tax Aspects of Service Robotics) The 5-foot, iPad-controlled robot is a rolling webcam that can navigate hospital floors fully autonomously while projecting a doctor's face and voice on a monitor for interaction with patients from half way around the world. It has a map that is integrated with hospital records allowing it to find patients on its own, so that a doctor can simply command it to visit a certain hospital room for a visit. This telepresence technology makes doctors more widely available, thus increasing doctor/patient interaction. Not only does technology like this enable live video conferences, but it also allows surgeons to operate on patients perhaps from anywhere in the world, with more precision and less scaring than traditional methods. The i-Limb Hand was originally launched by Touch Bionics Inc. (Mansfield, Massachusetts) in 2007 as perhaps the world's most advanced and versatile prosthesis available. 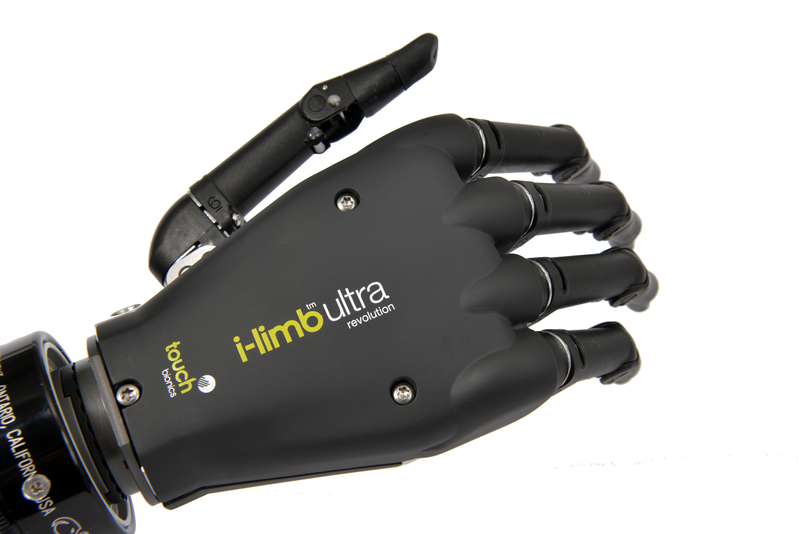 With over 20 years of research and development behind it, the i-Limb is designed to move and look like a natural hand. The company says its product -- "offers more dexterity and moves more like a natural hand than any other powered prosthetic hand." It allows users to program a number of different grip types that can be triggered by different muscle movements. For people that use certain objects repeatedly, the company has introduced "grip chips" which can be stuck to objects in order to activate a certain grip type when the hand comes into contact with the object. For instance, a user could stick a "grip chip" to a keyboard so that the prosthetic hand always uses the appropriate grip strength when typing. It is this type of innovation which continues to drive the industry worldwide. Ekso is a San Diego based company that makes robotics designed to help disabled people or make the human body superhuman. Its name originates from the word "exoskeleton". The company was originally financed by the military in a collaborative effort with the University of California, Berkeley and Lockheed Martin to develop the "Hulk", an exoskeleton which allows soldiers to carry heavy equipment over mixed terrain. More recently Esko has been designing bionic suits for physical therapists which help their patients get out of wheelchairs and make use of their lower bodies so their muscles do not deteriorate. The titanium/aluminum suit costs about $140,000 and includes several levels of difficulty so patients can reduce the assistance provided by the suit as they make progress. The product looks like science fiction, but offers new hope to many veterans paralyzed by spinal cord injuries. Soldier Socks, a Stamford, Connecticut based nonprofit company plans to purchase and donate 10 suits to Veterans they expect will use them full time, rather than like an exercise bike which might sit out and gather dust in the garage. The machine is battery operated and the settings can be set so that either: 1) the therapist controls using a button for each step, 2) the patient controls using a button on the crutches or 3) the patient controls simply by shifting his/her weight. With recent advances in carbon fiber durability, battery technology and robotic control systems the functionality of the device is becoming increasingly practical. Still, the major obstacle is its price. At $140,000 the machines are specialized and scarce. Nonetheless, wider use by the military coupled with research and development aimed at efficiency might help bring costs down. Russ Angold a founder and chief technology officer at the company envisions a day where one is -- "able to walk into a sporting goods store, like an REI, and pick up an exoskeleton . . . [t]hey're like the jeans of the future." Perhaps the most extensive use of robotic technology for medical applications has been in rehabilitation robotics. 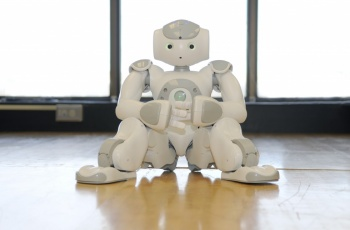 The MEDi robot (short for Medicine and Engineering Designing Intelligence) by the French company Aldebaran Robotics is a robot designed to help ease anxiety in children during routine medical procedures. The robot greets children with a high-five, collects toys and asks questions to help divert attention. During a flu shot the humanoid asks a child to blow on a toy which it describes as dusty. While the child exhales the nurse timely injects the needle. Researchers at Alberta Children's hospital in Calgary, Alberta conducted a study in which they performed medical procedures on 57 boys and girls divided into segments with and without the assistance of robots. What they found was that the children in the robot group were significantly more cooperative and experienced less pain and distress than the children in the other group. This is because the robot acts as a decoy during the process. The U.S. Department of Veteran Affairs uses robot-assisted training to help people with moderate to severe weakness in their extremities. Their research and development includes using robotics to develop and test new rehabilitation therapies in order to empower Veterans and other disabled Americans throughout their lives to fight back against disability and improve cardiovascular health. At the Medical Robotics Technology Center at Carnegie Mellon (The Robotics Institute) researchers are innovating in areas such as computer-assisted surgery, smart medical and diagnostic tools, rehabilitative and prosthetic devices, assisted living, preventive healthcare equipment and continuous healthcare process improvement. Their most recent innovation involves the HeartLander which is a miniature mobile robot designed to facilitate minimally invasive therapy to the surface of the beating heart. Under physician control, the robot enters the chest through a tiny incision below the sternum, adheres to the epicardial surface of the heart, autonomously navigates to the specified location, and administers the therapy. At MIT, researchers are working with Boston Marathon bombing survivor, Adrianne Haslet-Davis, a professional ballroom dancer who lost part of her leg in the attack. The group has spent the past 200 days developing a new prosthetic limb for Adrianne that will allow her to dance again. This is consistent with much of the Universities' biometric robotics research which focuses on designing robots that function like humans do. But before figuring out how to make a robot arm or leg maneuver a certain way scientists must figure exactly how and why the human body operates the way it does in order to translate the process to the robots. Thus, much of the research focuses on the musculoskeletal and neuromuscular systems. Here the concept is to develop billions of microscopic robots and set them to work within the body. They could be sent out to fix broken bones, deliver medication to a certain place or exterminate cancer cells. They are largely in the research-and-development phase but scientists from Harvard have already discovered a way to make the nanorobots bind to leukemia and lymphoma cells and then self-destruct, killing the cancer cells in the process. . These innovative efforts involve the use of bio-engineering to construct synthetic DNA molecules using predictable chemical rules. Instructions to self-destruct are then sent out by altering the environment around the bots which causes them to have a natural chemical reaction. But, as innovative as this may seem some developing ideas are far more ambitious. Google's director of engineering Ray Kurzweil has this to say: "We'll have millions - billions of blood cell-sized computers in our bloodstream in the 2030's keeping us healthy, augmenting our immune system, also going into our brain, putting our neo-cortex on the Cloud," This is consistent with Google and the rest of the industries aggressive stance on robotics innovation. Google Inc.'s venture capital unit has recently backed an ingestible robotic-like injection-pill that punctures the small intestine with tiny hollow needles made of sugar. The sugar-needles then safely deliver drugs so the patient does not have to poke him/herself with a syringe every day. Such an idea is still largely in the developmental phase because stomach acids break down proteins in the pills before they reach the small intestine. Recent advancements in scientific development have stirred up ideas that would have been unimaginable just a few years ago. Mir Imran, the brainchild of the drug says clinical studies have shown that his robotic pill can boost drug absorption at least as high as syringes can. The next step is intensive trial and error testing with pharmaceutical companies. Proteus Digital Health Inc. of Redwood California has recently received FDA clearance to put sensors in pills in order to help doctors determine how much of the drug patients have taken. The medical industry is experiencing exciting innovations in robotics. Research & Development is driving the efforts. Taxpayers should be aware of Federal and State tax incentives which are available to help shoulder the costs of innovation.